He just needs to specify an error is in which of these sentences. I formulated the problem of maximum own time for different scientists. Nobody answered me. Most of them could not enter the subject at all. I specifically went to the Astronomical Institute (SAI) to find out the opinions of specialists. I met a sensible scientist who answered my questions briskly. I decided that it’s time to tell about the paradox with a maximum of time. The scientist was puzzled. It was clear that he heard for the first time about the statement: “The true orbit corresponds to the maximum proper time”. However he quickly wrote the equation of motion, looked at it closely and said: Yes, the true orbit corresponds to the maximum of its own time. It was clear that he was well versed in general relativity, but he had never heard or thought about the maximum time. Naturally, he was able to solve the problem. He said that after a while the main theoretician of the Institute would come. He certainly will be able to explain everything. After SAI I decided to write a letter to the academician of the Russian Academy of Sciences Lev Okun. This academician was not just versed in general relativity, but was a leading expert in Russia on this theory. He often wrote articles in the journal “Successes of physical sciences” (“Uspekhi Fizicheskikh Nauk”), performing the role of the main referee. In these articles, he intelligibly explained what view is correct within the framework of general relativity, and which is not correct. He explained the general theory of relativity even to professors and doctors of sciences. Will he answer me? Running forward, I will say that at the Institute of Metrology of Time and Space (Mendeleevo), one of the leading scientists, a candidate of physical and mathematical sciences, he told to Lev Okun that he wrote him letters several times by e-mail. The academician replied approximately like this: I receive many letters, I cannot answer all. I carefully thought through the letter before sending it. I kept silent about the paradox of maximum time, I decided to wait for an answer. Oh, a miracle! Academician answered me. Then I wrote about the paradox. I formulated it in the form of four sentences and asked Lev Borisovich simply indicate which of these proposals is a mistake. That is, I reduced his task to a minimum. Nothing needs to be explained and written for a long time. He should just write one number out of four. It is just like in the Unified State Examination! The four sentences looked something like the following. 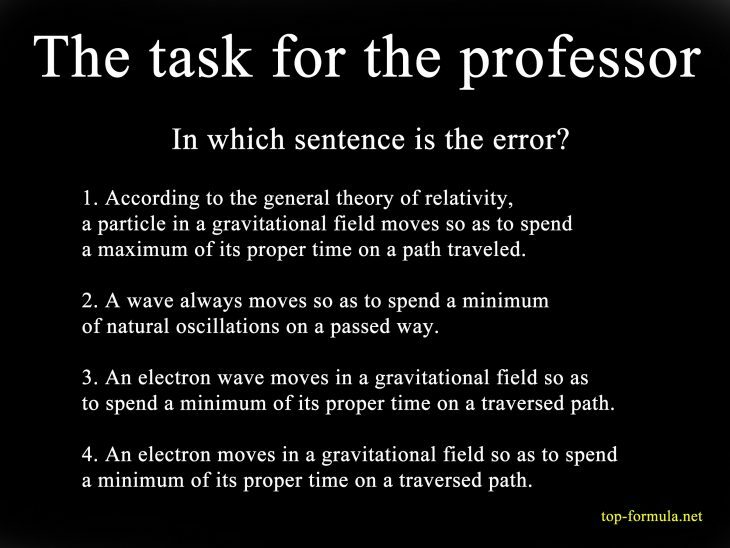 According to the general theory of relativity, a particle in a gravitational field moves so as to spend a maximum of its own time on the path traveled. A wave always moves so as to spend a minimum of own oscillations on the path traveled. An electron wave moves in a gravitational field so that to spend a minimum of own time on the path traveled. An electron moves in a gravitational field so as to spend a minimum of its own time on the path traveled. Will the academician answer me for the second letter or not? If he does not answer, he will indirectly acknowledge that he does not know the answer. It is unlikely. So, he must answer. But what will he say? The next day I received an answer. He was very short: just one short equation.